The most-loved character and the so-called "miracle boy" will return on TV this Sunday night in a special documentary TV program. Zaijan Jaranilla reprises his role as Santino of the hit inspirational TV series "May Bukas Pa" and will tell us the life story of the beloved Pope Blessed John Paul II. This is via a special documentary TV program "Banal" which will be aired on ABS-CBN's Sunday's Best! Aside from Zaijan, veteran actor Mr. Jaime Fabregas also reprises his role as Father Anthony. Santino and Father Anthony together will share us a chronicle of the life story of of the well-loved Pope who is widely regarded as one of the most important world leaders of the 20th century. “Kids will learn a lot from ‘Banal.’ They will learn how to be obedient, to pray all the time, and just become good boys and girls,”, Zaijan said in an interview. “When he was still alive, he’s like a celebrity but he is better than a celebrity. My grandmother told me a lot of people want to see him,” the child wonder added. 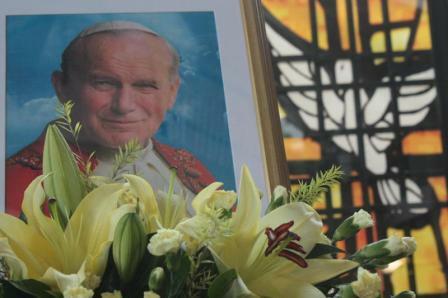 Look back at how Blessed John Paul II touched the lives of many Filipinos, who are undeniably close to his heart. He visited the country twice as Pope and little did many people know, that he also visited the Philippines once when he was still a cardinal. He also named one of the oldest churches in Rome, Santa Pudenziana, as a national church of the Philippines that serves OFW’s in Italy. Well, let's join Santino and Father Anthony this Sunday night, May 22, 2011 in the network's News and Current Affairs special documentary offering "Banal!" It will be shown right after "Gandang Gabi Vice" in "Sunday's Best" only in ABS-CBN!